Amada Profile Grinders - Texmac Inc.
Ultra-accuracy mold parts, advanced profile realizes “SHINING” surface. 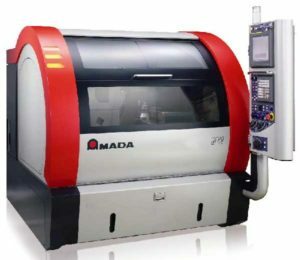 Amada is the world leader in CNC Optical Profile grinding. This technology has evolved radically over the decades. Historically, and even now, grinding specialists have labored in darkened grinding rooms to perform this highly skilled manual process. AMADA MACHINE TOOLS’ proprietary positioning scale and hydraulic servo system can achieve 250 min-1 high speed reciprocation and significantly increase grinding efficiency. AMADA MACHINE TOOLS’ original software and CCD camera allow for on-board profile measurement without the need of removing a workpiece. This can reduce the number of processes and prevent an error upon installation in the measurement process. In addition, the difference between the measured workpiece profile and the target values is calculated for programming. Compensation requires short lead time. The integrated high rigidity T-shaped bed, C-shaped column structure and crosswise overhangless structure ensure high straightness accuracy. The SSR5 is the ideal machine for precision grinding circular shaped workpieces. To achieve the highest level of precision for flatness on circular parts, the SSR5 is the ideal choice. While ideally suited to surface grinding circular shaped parts, the SSR5 is also very efficient when batch grinding any shape parts. As there is no wasted time reversing direction like a reciprocating grinder, efficiency is maximized. High efficiency and high accuracy are assured with the MX150 Multi-function Grinding Center. The MX150’s unique design combines together the capability of a 5 axes milling machine with grinding capabilities. This allows the user to not only perform high accuracy milling, but also high accuracy grinding. This unique combination allows you to machine highly complex parts in a single operation more accurately and more efficiently.